A New Zealand "official" (and socialist) backs Iran. 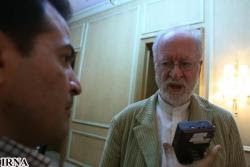 New Zealand's National Advisory Council for Disarmament Ex-Chairman Robert James Rigg said on Thursday that the report presented by IAEA Director General Mohamed Elbaradei to IAEA Board of Governors indicates that Iran's nuclear dossier should be referred to IAEA. Speaking on the sidelines of the international seminar on "Iran's nuclear program and ElBaradei's report, he said it was an excellent report which indicates that Iran's nuclear issue should be resolved by IAEA and there is no room for interference of UNSC. ElBaradei's report also indicates that Iran's nuclear dossier should be merely resolved through peaceful and diplomatic means. Iran should mobilize the world public opinion in support to its legitimate rights because the world public opinion can force governments to recognize Iran's rights, he said. Rigg said "Iran's nuclear issue should be resolved by IAEA and there is no room for interference of UNSC"
Iran's nuclear issue will be resolved by the US and/or Israel. Rigg said "Iran should mobilize the world public opinion in support to its legitimate rights"
This is rich. Rigg says it's Iran's right to have nuclear technology. How about NZ? NZ has a far greater need for nuclear tech than Iran. Don't the same reasons that NZ doesn't have nuclear tech apply to Iran? I guess not if you are a leftist hypocrite who is aiding Iran achieve nuclear weapons capability in his small way. Nuclear power is evil if a Western country wants it, but it's OK third world tyrants and Iran.